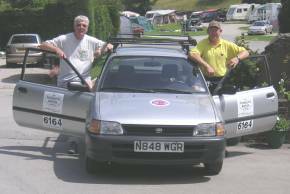 Nick Capron and Tim Lovatt acquired a 1996 Toyota Starlet, with the intention of driving from Cumbria to Banjul in The Gambia as part of the 2006 Plymouth-Banjul Challenge. 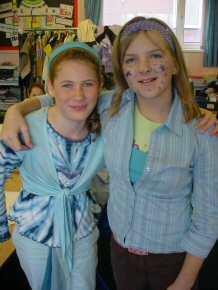 This page describes their preparations for the Challenge, and the fundraising events which raised sponsorship for them. Use the links at the top of the page to see other parts of their story, or to return to the Shap Ahoy Summary Page. Will it all fit in? Why did they do this? For several reasons. Their wives have agreed to let them go. How did they help the charities? The Challenge benefits Registered Charities in The Gambia. As cars are among the most coveted items in the Gambian order of priorities, vehicles and equipment that complete the journey are received by the Control Committee in Banjul, and auctioned off. The Grants allocation sub committee pools the money raised for distribution. At the heart of the Gambian end of the Challenge there are two organizations working very closely together. The first is the Association of Small-Scale Enterprises in Tourism (ASSET). The second is the Gambian National Olympic Committee (GNOC). ASSET operates, as its name implies, in the tourism industry. But it is as far away from the activities of the big tour companies as can be imagined. ASSET was set up to help thousands of Gambians to scoop up more of the crumbs from the tourism table and to 'give a voice to the voiceless'. It lobbies government to do more for the juice pressers, the fruit sellers, the tourist taxi drivers, the official tourist guides and people with many similar jobs, all of whom struggle to gain access to the tourists who are managed by the tour operators and the bigger operating companies. By contrast the GNOC is about making things work for the country's sports persons. There is huge interest and participation in sport. Those of you who have not been to a country like The Gambia will be staggered by the huge numbers of 'football pitches' - patches of bare sand - at least one in every village. Very few people can afford the kit that gets bought for kids in the UK. Football boots and footballs are in very short supply, and to see a goal with a net is almost unknown. The GNOC struggles hard in these circumstances to offer a variety of sporting activities and to build stadia around the country. 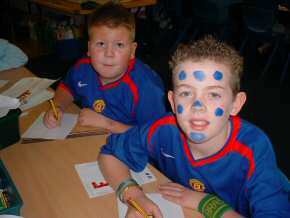 In addition to the above, Nick and Tim are also setting up links between local schools, and schools in West Africa. This will raise awareness of Africa's needs to children in Cumbria. Money raised, following the delivery of the vehicle to The Gambia, will be used to develop school buildings and facilities through Pageant, in particular supporting the development of Saloum Nursery School in Nemakunku, where they are hoping to fund classrooms and a toilet block. Work is progressing at a furious pace. The trusty Toyota Starlet has been given a free MOT and full service, has had six new tyres fitted and has been insured by three of our sponsors. The level of interest the car is generating as it drives around South Cumbria is considerable. A full press release is planned for next week when Pageant should receive some good publicity. Much equipment has already been donated, including tents, sleeping bags, camping equipment, food, water bottles and jerry cans. All of this will be sold in the Gambia to support Pageant. Both team members have their visas and are ready to go.! The ferry should be booked this week - the anticipated departure date is Saturday December 17th. Nick has returned to work now with a vengeance and the full might of Cumbria County Council Education department School Improvement Team has swung behind the efforts of Shap Ahoy to raise enough money for two classrooms and the refurbishment of the toilet block, through Pageant, at Saloum Nursery. Schools have started to promise support for the venture and are beginning to plan fund raising activities for this Gambian nursery school. As the nights draw in. 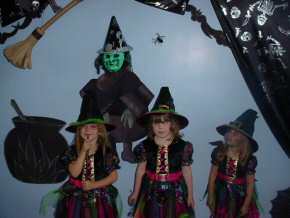 the season is slowing down from hectic to just very busy on Tim's campsite, the Park Cliffe Caravan and Camping park. He continues to get invaluable support from many of the customers on the site. This Saturday will see a convoy of cars driving round the South Lakes area in search of clues, on a treasure hunt organised by one of his regular customers. 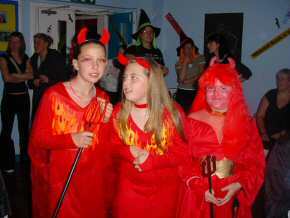 This will be followed by a hot-pot supper in the bar of the site, with all proceeds going to Shap Ahoy's charity work. The team have also been in touch with another Group 1 team from nearby Kendal. Nick was able to put them in touch with a LHD vehicle which he has spotted on his way to work - having done a rapid U turn when he noticed it parked on the grass verge with a 'For Sale' sign in the window. there was no need for a stewards' inquiry over the hotpot in the packed bar afterwards. Tim, in a moment of fund raising inspiration, suggested that if a suitable kitty was put behind the bar, Jill - the singing pint puller - would give a tuneful rendition - over £100 was pledged and a virtuoso performance of 'The Greatest Love of All' followed. John and Carol provided an excellent trophy for the winners and even the recipients of the hand crafted 'dipstick' award were delighted with their prize. Nick and his wife Jenny (half of the Shap Ahoy team) would have further worried the leaders board - if they could only have located a wooden door key! The next event at Park Cliffe looks likely to be a talent night. 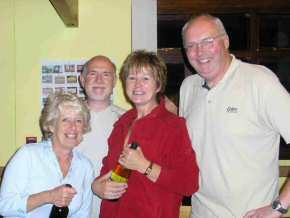 Pictures of the winning teams of the Park Cliffe Treasure Hunt. 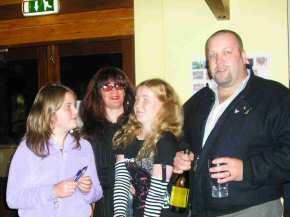 <<< The organisers - Tim Lovatt, Carol Horrocks, Arlene Lovatt & John Horrocks. This is a recent picture of Tim and Nick with their Toyota. The car is sporting the names of the major sponsors, and so has been christened 'Bill' - short for 'Billboard', which is what he now resembles. The rear window and rear side windows have been left relatively clear to give room for (hopefully) more sponsors. Nick is a lifelong fan of Hull City having followed their fortunes both home and away for the last 30 years. Adam Pearson the chairman of Hull City has agreed to offer support to Shap Ahoy. The team will now be carrying child sized Hull City AFC shirts to the Gambia to donate to Saloum Nursery School. Nick is hoping that in the future a budding Gambian star will be pulling on the Amber and Black on his beloved Tigers. Pageant members Vic & Jackie Edwards have just returned from visited The Gambia. They presented a 'giant' cheque for £1000, raised by Shap Ahoy, to the Headmistress of Saloum Nursery. This picture shows the presentation of the cheque. The headmistress of Saloum Nursery is on the left, in green. More pictures can be found on Pageant's Saloum Nursery page. 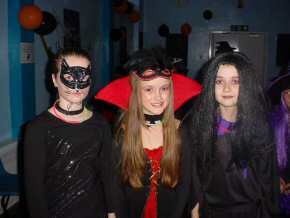 St Mary's RC Primary School in Kells have held a sponsored fancy dress disco to raise money for Shap Ahoy. 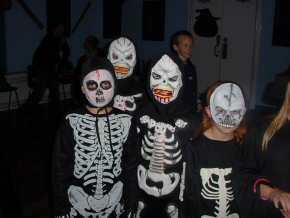 The children raised £150. 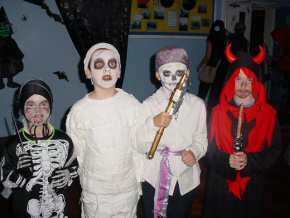 Pictures of the children in their fancy dress costumes will be posted here shortly. We had an 'end of season' bonfire, fireworks & quiz night last night (Sat 12th). 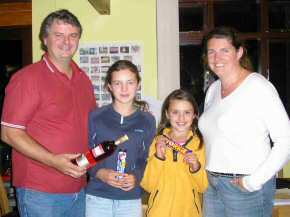 The winning quiz team ('Togs' - the Worden family) very generously donated prize money to our fund, which added up to nearly £400 on the night. £80 was raised in a single game of 'stand-up bingo', the prize of an enormous toy dog was the obvious attraction, generously donated by the Young family. A raffle went down well with a varied array of donated prizes, with special thanks to Carol Horrocks for the home made Christmas Cake. Along with further cash donations this week (nearly all from our customers), we will be counting over £700. Update 19 November - Will it all fit in? Nick and Tim pose with their car and some of the gear which they will be taking on the Challenge. This doesn't include their personal clothing. Fortunately they have had new shock absorbers fitted to the rear suspension. 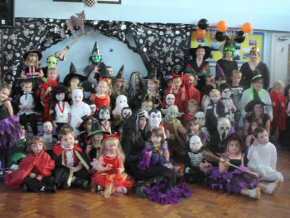 St Mary's RC Primary School in Kells near Whitehaven, held a fancy dress Halloween Disco to raise money for Saloum Nursery through Shap Ahoy and Pageant. Anyone of a nervous disposition is advised to skip these pictures and go straight to the next section. Other schools also sponsoring Saloum Nursery through Shap Ahoy are Shap CE Primary School, who held a non uniform day and St Gregory's and St Patrick's RC Infant School who supported Shap Ahoy as part of their 'Children in Need' day and are planning a further fund raising event. 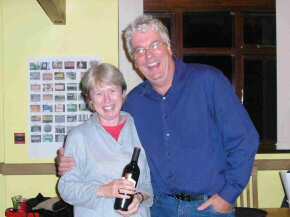 Other recent sponsors have included Ken Capron and Enid Phillips, Nick and Jenny's American friends. Amy, Steve, Aaron and Katie Hill, who live in Germany are also now regular readers of the Pageant web site and have been collecting for Saloum Nursery through the Shap Ahoy team. Final preparations are now well underway. Tim had a final packing test, and everything fitted - just! Last minute items are beginning to be bought - including coffee for the caffettiare, tinned stew for use in emergencies, Imodium in case of digestive problems and also supplies of soft toilet paper - sufficient to last three weeks. Tim has now had all his injections and Nick has one more visit to the doctor's to complete his jabs - finally a visit to the chemist for malaria tablets prior to departure on Saturday 17th December. 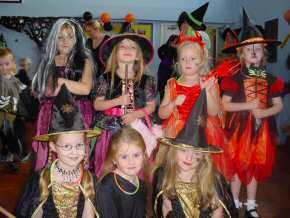 Our Lady and St Patrick's RC School in Maryport held a fundraising day on Friday 25 November. 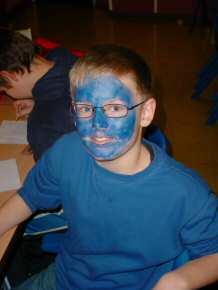 The day was part of their bullying awareness campaign. Pupils brought in 50p each and money raised has been donated to Shap Ahoy's work to support Saloum Nursery School through Pageant. Some pictures of the event are shown below. Nick's brother Tim and his wife Sylvia have spread the word about Saloum Nursery, Pageant and Shap Ahoy in County Durham and have made a donation towards the teams project. More promises of support have been received from Cumbrian Schools and details of their work to support Pageant will be posted here shortly. The final push for sponsorship is on. Nick's mum Pat has made a VERY generous donation to take the funds over the £3000 mark. The final member of the Capron trio Jane has also donated to the fund. 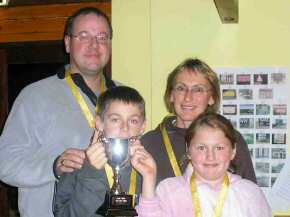 The Staffordshire branch of the Capron family - namely Thomas, Kattie, Jane and Mike are now supporting the bid. Jessie Hodgson from Hull has also made a donation. 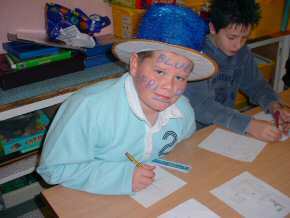 Beckstone Primary School in Harrington, near Workington held a non uniform day on Friday 2 December. The event has raised £112 for Shap Ahoy and Saloum Nursery. 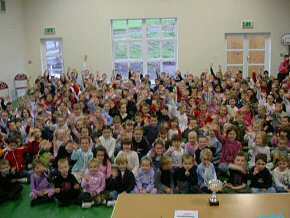 The picture shows virtually the whole school. Nick and Tim met on Friday 2 December to finalise arrangements. The departure point will be a service area on the M6 - breakfast with wives and then off into the distance. Much discussion centred around finding a tinned Christmas dinner - so far no luck. Does anyone have any suggestions!! Nick and Tim would like to thank all their sponsors. 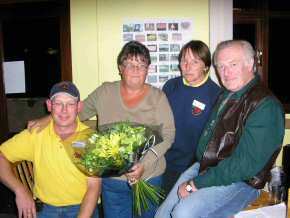 They would not have succeeded without their generous donations and other help. The full list to date is: Cumbria County Council - School Improvement Team; The pupils of Fairfield Junior School, Cockermouth; Cumbria Schools; Nick Tunstall, Tolerant Systems - Computer software & security solutions; Windermere Health Centre, Doctors Watson & Stokes; Tony Cavanagh, Document Solutions Ltd - Office machinery suppliers; Beacon Home Improvements; Beacon Insurance Services, Penrith; The Gambia Experience; R.N. Humphreys Associates; Chris Hardy - Aerial installations; Windermere Auto Centre' Ian Hunt, The Warehouse - kitchen suppliers; Lound Road Garage Kendal; E K Brakes - motor factors; Holgates Caravan Parks; Kendal Camping Centre; Peter Talbot Insurance Services, Kendal; Ian Bradshaw - decorators; Robert Mallinson, mobile mechanic; C M Signs Ltd - sign writers; Longhorn Hardware - Kendal; Barbara & Keith Molelieu; John & Betty O'Brien; Ian Coates; Tony Corwood; Angus Knox; Pat Robinson; Brian & Friends; Ed & Den Mathews; John & Carol Horrocks; Ken & Christine Hamer; Corrine & Jim France; Will Robinson; Mr & Mrs Nelson; Mr & Mrs Nickson; Carol Whiteley; Jack and Margaret Scarborough; St Gregory's RC Catholic Primary School; Stuart Morgan; Beckstones Primary School; St Benedict's Catholic High School; All those who took part in, and helped with our Treasure Hunt; David Pennick, Photo Express - Bowness-on-Windermere (David Pennick will provide Team Shap Ahoy with a new Digital Camera to record the trip, and it will be donated at the end of the Challenge); Tony & Gail Thomas, World Clean - Halifax; Ken Jones, Dairyman - Kendal; John & Liz Christopherson; Jim & Norma Hodkinson; Jim & Sylvia Britton; Brian & Christine Edwards; Chris & Tracey Spooner; Clyde & Debbie; David & Christine Frederick; Antony & Karen Young; Mr & Mrs Bailey; Nigel & Christine Hall; Mike & Janet Schofield; Paul & Jackie Dunnings; Dennis & Rosemary Abel; Les & Trev Fielding; Peter & Linda Worden - K Pumps, Preston; Mr & Mrs Andrew Duckett; Ruth & Neil Birch; Andrew & Sarah Robinson; Harry & Peggy Gordon; Andrew & Anne Gordon; Paul & Judith Preston; Chris & Corrine Ducker; Ruth & John Crossley; Joe Crossley; Stuart Newton; Sue & Molly Wilson; Mr & Mrs Marshall; Julie & Adrian Wilde; St Catherine's RC Primary School, Penrith; City of Sunderland School Improvement Service; Egremont Rotary Club; Cumbria County Council - West area school improvement team; St Patrick's RC Primary School, Workington - who donated the proceeds of their carol singing in Marks and Spencers. Plymouth-Banjul Challenge 2006 website gives a great deal of interesting information about the Challenge, and there is a Shap Ahoy Team Page.